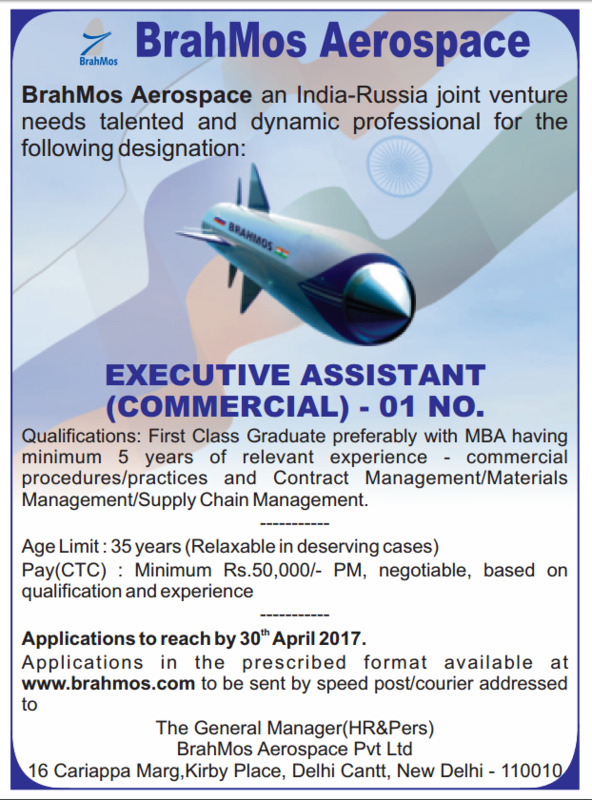 Brahmos Aerospace an India-Russia joint venture needs talented and dynamic professional for the designation of Executive Assistant (Commercial) for fill up 01 Vacancy. The last date for submission of applications is 30th April 2017. Minimum ₹ 50,000/- PM, Negotiable, based on qualification and experience. Educational Qualification and Experience: First Class Graduate preferably with MBA having minimum 5 years of relevant experience - commercial procedures/ practices and Contract Management/ Materials Management/ Supply Chain Management. How to Apply: Application in the prescribed format. The duly filled applications along with required documents addressed to The General Manager (HR&Pers), BrahMos Aerospace Pvt Ltd, 16 Cariappa Marg.Kirby Place, Delhi Cantt, New Delhi -110010 by Speed Pst / Courier. The last date for receipt of applications is 30/04/2017.